The speed at which Brice Mouapele moves through the dense tropical undergrowth is impressive. The hot damp humid air is stifling, but Mouapele appears unaffected as he brushes past thick shrubs and jungle vines in his camouflage fatigues clutching his rifle. 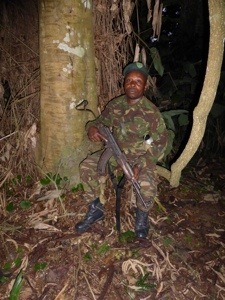 The 39 year old pygmy is the latest addition to the team of eco-guards patrolling Congo’s Odzala-Kokoua National Park. He is also the first pygmy to turn from elephant poacher to protector. “Before becoming an eco-guard when I saw elephants I wanted to kill them bare handed. For us pygmies poaching/hunting is not a difficult job because we grew up hunting. I used to be a major poacher and I learnt this skill from my father, over time I grew up with the spirit of a hunter,” he says. Last year the first firearms amnesty in Congo run by the non profit organisation African Parks offered poachers training and work to become eco-guard in return for information and guns. It led Mouapele to handing in his weapons and signing up immediately for the prospect of job security. 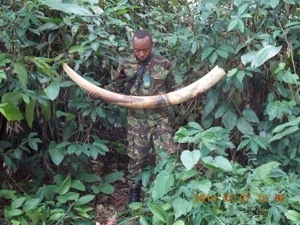 He now works 22 days a month patrolling Odzala-Kokoua National Park getting up at dawn most days. The role has given him status both in and outside his community, something he is immensely proud of. “Mouapele name means Brave Man, I am happy to be an eco-guard, I am not afraid. Poaching is a job with too much risk. Not only are you in permanent danger from animals – my brother died after an elephant charged him – but you are also in danger from prison,” he said. But crossing over to the other side increases the threat of repercussions from former poachers he once hunted alongside. A danger he is well aware of. Although he has not yet started a family, he accepts that his loved ones could also be at risk of revenge attacks and will need to be relocated. African Parks say relocation is offered to those families most vulnerable especially if ex-hunters have given testimonies which have secured convictions for well connected ivory dealers. Odzala-Kokoua National Park stretches over more than 13,000 square kilometres and is made up of mostly lush equatorial forest. It is home to an estimated 9,600 endangered forest elephants. The threat of poaching has increased over the years as the demand for ivory in South East Asia continues to grow. Conservationists estimate that raw ivory can sell for as much as £1,000 a kilogram on the Asian black-market. Pygmy communities are among the poorest in Congo and the majority of them can be found in the east bordering the park. Western influences such as alcohol and cigarettes are now permeating these ostracised communities and it is impacting on their traditional hunter-gatherer lifestyle. Conservationists working alongside pygmies say these communities view natural resources as their larder. Under the cover of the canopy they efficiently harvest honey and local game. Their population levels have never been high enough to impact negatively on wildlife and their nomadic life has meant areas have time to regenerate when they move on. But this attitude is changing as pygmies are now seeing that ivory is more valuable than the forests in which they live. Mouapele is probably no taller than 1.5m. But he holds his head high, his job gives him focus and the conservation message is something he firmly believes in. When I ask him what hope he has for the future, he tells me, “All I wish for is a better future for Odzala Park and its biodiversity. great efforts to save africa’s wildlife. Thumbs up to you Asha.